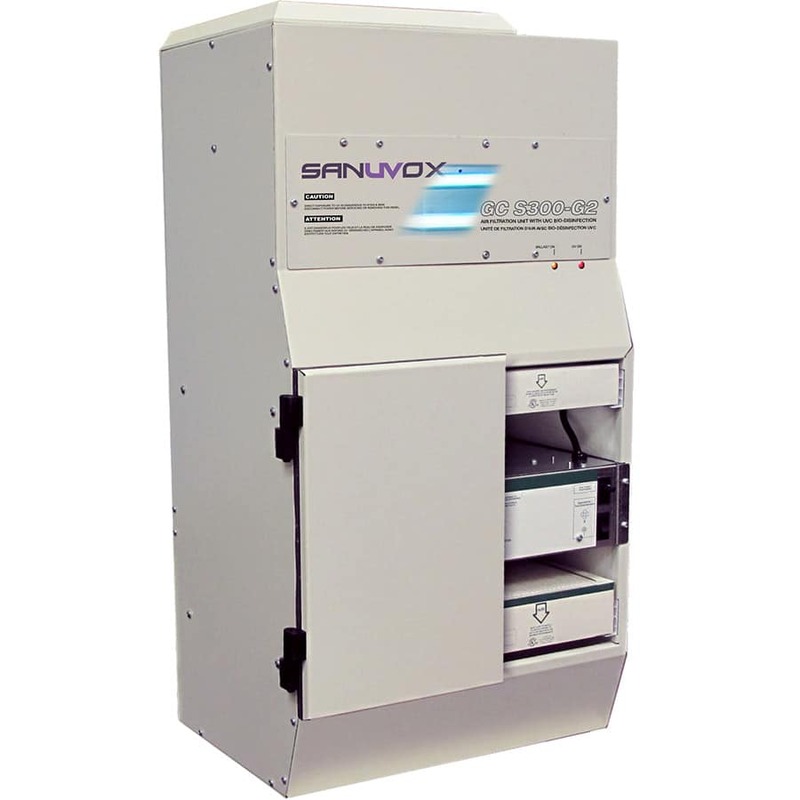 Sanuvox UV has operated within the Indoor Air Quality Industry for over 21 years assisting Hospitals, Schools, Office buildings and homes in their fight against microbiological (mold, virus, bacteria) contamination. Specific to the Cannabis industry, Sanuvox aims to assist a Cannabis grower in a multi-faceted approach in the prevention of Powdery Mildew, Botrytis, Fungus and other microbiological contaminants that pose a risk to the health of the plants. Our approach is to provide the plants a consistent growing environment harvest after harvest, controlling air, odor and surface contaminants through every phase of cultivation. Outlined below are brief application overviews where Sanuvox can assist a Cannabis grower aiming to implement a full facility, chemical free preventative approach to mold, fungus, bacteria, odor, and particulate reduction. As any grower knows, Powdery Mildew is a fungus that should not be ignored and must be constantly prevented for the quality and consistency of any cannabis crop. Sanuvox offers two methods of micro-organism prevention (such as Powdery Mildew, Botrytis, Gray Mold, Downey Mildew, etc.) We have patented an air disinfection system called Biowall MAX which is placed parallel to airflow with (5) High Intensity UVC lamps within the return or supply ducting of the Heating, Ventilation, Air Conditioning system so that whenever the air is heated or cooled, it is also being disinfected of micro-organisms and spores. 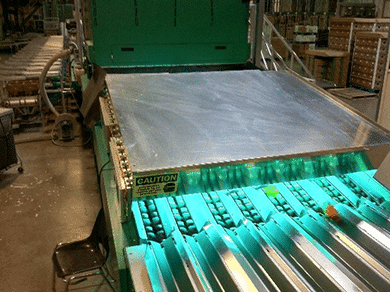 This is the top preventative method to achieve 99% disinfection on an hourly basis and the most economical, chemical free method of ongoing prevention. Within the H.V.A.C. system, there is an evaporator coil designed to take heat (cooling the air) and humidity out of the air. The evaporator coil is cold, dark, damp which are three perfect scenarios for the growth and infiltration of mold and microbial contamination. One of the most prevalent micro-organisms that grow on the fins of an evaporator coil is Aspergillus Niger Mold, Botrytis Mold and Stachybotrys Mold spores. These spores will multiply into colonies and form Biofilm onto the coil surface which will drastically decrease the cooling efficiency and humidity performance of the coil. Once a biofilm has grown on the fins of the evaporator coil, the coils performance to achieve the desired temperature and humidity levels decreases upwards of 20%. Thus, it requires more energy to achieve the room temperature setting and longer run cycles to achieve the recommended humidity levels. Secondly, the mold colonies within this biofilm will sporulate, become detached and enter the grow space, where they can spread onto plants, surfaces, and other objects within the room. 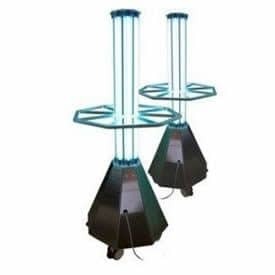 By adding Sanuvox UVC Coil clean lamps to evaporator coils of the H.V.A.C system, mold and biofilm will be prevented and pose zero risk of contamination to the grower. Lastly, UVC on the evaporator coil will restore the coils efficiency to new performance allowing a grower to achieve desired temperature and humidity levels without wasted energy and time. Within certain Indoor Cannabis facilities, indoor particulate (dirt, dust, and debris) are always at an increased load level. Within certain HVAC systems, the filtration capacity is very low. Most growers are using MERV 8 filtration which will only capture around 50% of the indoor contaminants growers face. Increasing filtration is not always as simple as purchasing a higher MERV rated filter as pressure drop from the filter can decrease cooling load and higher MERV rated filters may not physically fit within the current HVAC system. Thus, many growers are adding the Sanuvox stand-alone units equipped with MERV 15 filtration (GCS1000 model) and HEPA filtration (GCS300 model), both of which will capture and kill up to 99.97% of indoor contaminants. The best part is the stand-alone units have their own fan motor, thus they will not affect the cooling load of the HVAC system. 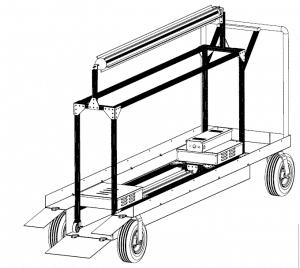 Many growers are using the stand-alone/self-contained units as spot treatment in problem areas and as protection from cross pollination from other nearby growers. Many indoor growers are operating at a negative pressure within the grow rooms by attaching one or more exhaust fans per room. While this method is not advised due to poor contaminant intrusion control, most growers utilize negative pressure to control odor on the outside of the facility as many municipalities have enacted fines for cannabis odor neighbor intrusion. Many of the exhaust installations consist of a product comprised of a fan with a carbon filter wrapped around the fan. 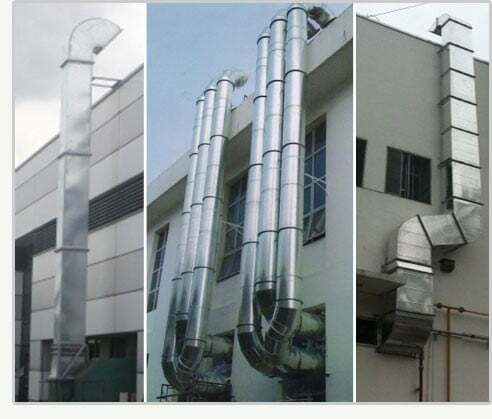 These products pull a certain amount of CFM (cubic feet per minute) of air through the carbon filter and exhaust the air outside the facility. Carbon filters are excellent at capturing odors, but lifespans for these low-cost carbon filters are extremely limited in such an odor dense environment. 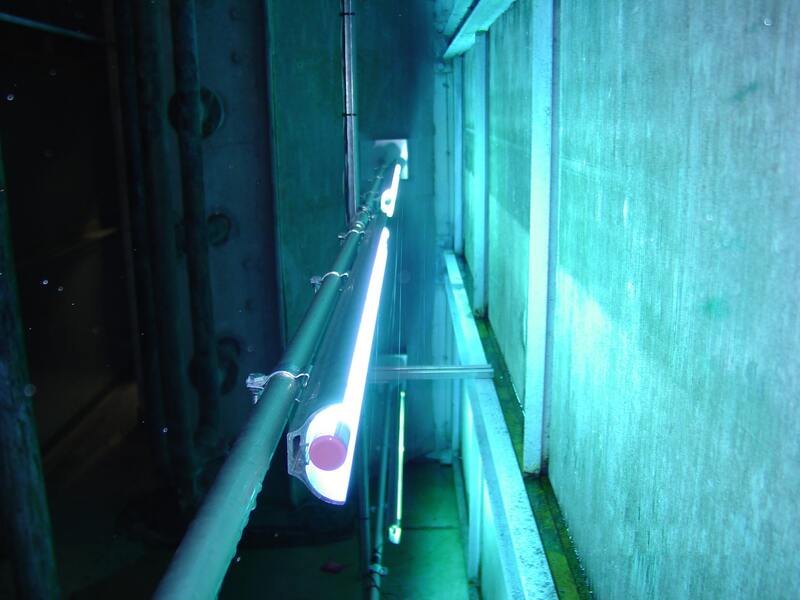 Sanuvox has been utilizing a higher frequency of UV light called Vacuum UV or UVV to destroy odors by photolysis. 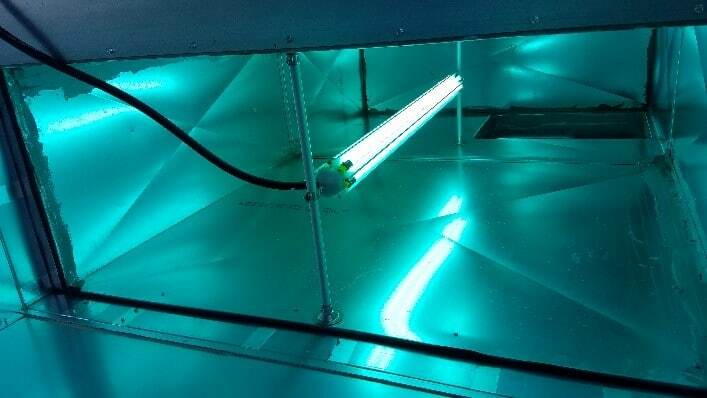 This frequency of light produces oxidizers that actively eliminate cannabis odors within a duct system. Utilizing a fan and 20 feet of ducting, the Sanuvox system can eliminate exhausted Cannabis odors. Maintenance required is routine annual lamp replacement, thus no more costly and urgent carbon filter change outs. Outdoor and greenhouse growers can also benefit from the use of Sanuvox UVC systems in drying rooms and in final product surface disinfection before testing or packaging. Product that is drying is still susceptible to mold contamination and the use of a stand-alone UVC air disinfection system is strongly recommended. The goal is to create a facility which allows for consistent harvests and treating every room is the best preventative strategy. A Cannabis grower spends months growing and battling contamination, no reason to allow infiltration in the drying/curing room. A second application for the outdoor or greenhouse grower is the disinfection of the surface of the buds before packaging and/or testing. The buds can be placed on a conveyor belt or a tray system where Sanuvox UVC lamps are placed above the belt or tray at specific distances and for a specific timeframe which is lethal to Powdery Mildew and mold, but harmless to the buds/terpenes themselves. This allows for the lowest possible viable mold, fungus and bacteria counts on the product surface as possible in a chemical free, non-toxic and residue free method. Cleanliness between grow cycles are extremely important as it prevents cross contamination and provides a clean starting point for the best potential potency, quality, and consistency in every harvest. Some growers choose to utilize chemicals such as chlorine dioxide to spray down rooms, tables, equipment within the grow room. 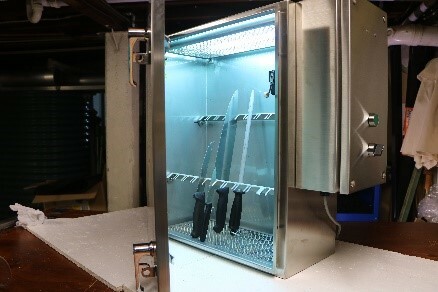 Sanuvox proposes a chemical free solution that leaves zero residue, is non-toxic, and is a clean green approved solution. Sanuvox has pioneered this disinfection method within hospital patient and operating rooms in the prevention of Hospital Acquired Infections. Sanuvox has two systems (Asept2x and BioCart) designed to be rolled into a room and left on overnight where the high intensity UVC lamps will disinfect up to 99.99% of surface borne contaminants that are on walls, tables, equipment, floors, and other items within a room. This method can be utilized in conjunction with your standard cleaning protocols for an all-encompassing cleaning approach.